Japanese Matcha powder organically grown to the best quality and with super value for money. Contents 180 g net. Matcha is a ground green tea leaf from Japan. This traditional invigorating drink has been drunk for hundreds of years. Matcha has a thicker consistency than green tea because the powder is mixed directly with water. In this respect, Matcha is not a tea infusion, but an extract from the fresh tea leaf with a correspondingly higher concentration of ingredients. 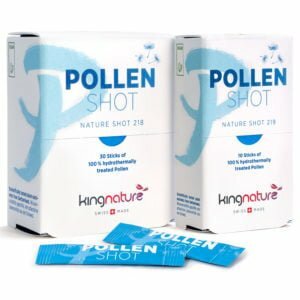 If you want to buy an organic Matcha powder, kingnature’s Matcha powder provides absolute top quality. We source our Matcha powder from Aiya in Japan. This green rarity requires meticulous cultivation and labour-intensive processing. 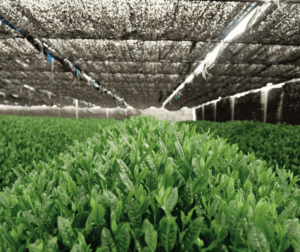 First, the green tea plants are grown with organic quality. 30 days before the harvest they will be shaded by nets (see photo). Now the plants receive only a fraction of the sunlight. Traditionally, this supports the enrichment of ingredients (e.g. chlorophyll, theanine, etc.). This is how the deep green of Matcha is created. After harvesting, the green tea leaves are briefly treated with steam to stop fermentation. This processing stage is called Tencha. All stems and leaf veins are then removed and only the pure leaf flesh is carefully and gently ground using old granite stone mills. The mills grind particularly slowly to avoid any frictional heat. 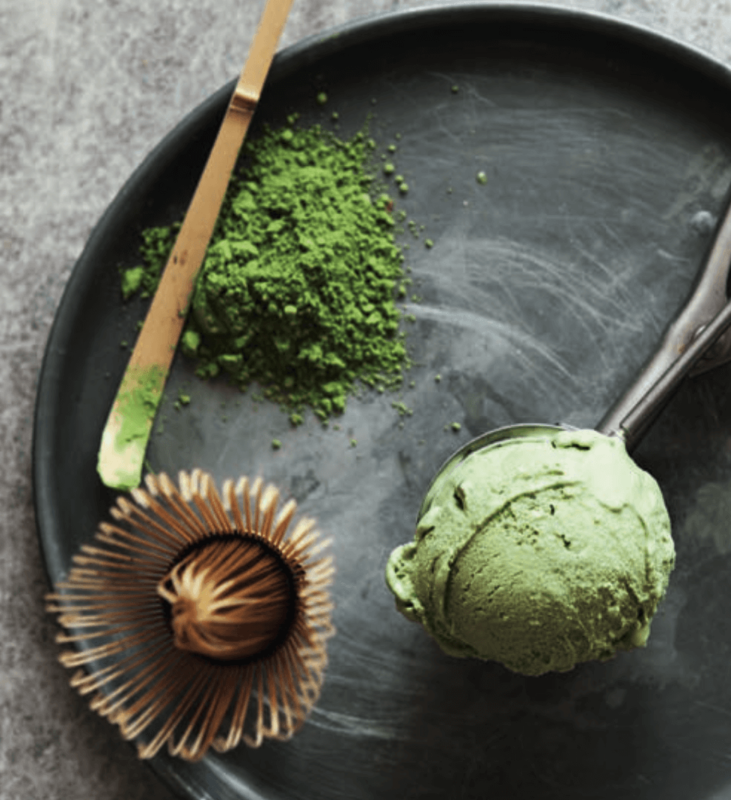 This Matcha powder is by far the best green tea you can buy. Why is Japanese Matcha so much more expensive than other green teas? Only 1% of Japanese tea growers grow green tea in Matcha quality. In total, only 0.05% of the tea grown worldwide falls into the Matcha category. It is, therefore, one of the rarest teas available. Matcha is also known as Superfood1 due to its special processing and special ingredients. The slow and gentle processing also explains the price difference when compared to traditional green tea. 1 Cf. Apotheken-Umschau: “Matcha-Tee: Wie gesund er wirklich ist” and welt.de: “Grünes Superfood: Matcha ist so widersprüchlich wie Japan”. How can I recognize real Matcha? 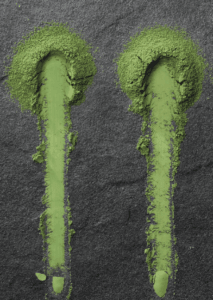 Matcha Green Tea Powder can be recognised in the so-called ‘stroke test’. Only the original Matcha powder allows a straight, velvety line to be drawn with the finger as in the photo. Industrially produced powder results in a sandy, interrupted line. This line is brownish, yellowish or greyish. The original Matcha powder, on the other hand, shows a deep rich Matcha green. In addition, real Matcha smells intensely of green tea. Its taste is not bitter, but gentle. What are the advantages of Bio Matcha powder? It is the original organic Matcha powder from Aiya from Japan. Traditional Matcha powder of absolute top quality. Ground slowly and gently with stone mills. Versatile use as a tea, coffee substitute, in smoothies or in various desserts. Buy Bio Matcha Powder now! Buy Bio Matcha Powder online now: We also accept Visa / Mastercard and Postcard. For orders over CHF 120, you order will be shipped free of charge (within Switzerland). EU customers please use our EU-Shop. 180 grams of pure organic Matcha powder. Net content 180 g. Currently in Stock. Organic Cultivation Certificate Our Matcha Powder is Organic! Our Matcha powder is certified organic and originates from organic cultivation. Here you can have a look at the organic certificate online . Add 1 teaspoon Matcha powder to approx. 60 ml water (max 80˚C) and stir vigorously. Matcha can be consumed in many ways: as a tea, as a coffee substitute, in a smoothie, for cooking or for preparing various desserts. Buy Organic Matcha Powder now!